With a reimagined easy-to-use interface and streamlined navigation, Artsystem5 Online is the new web-based version of the industry-leading software, Artsystems Pro. 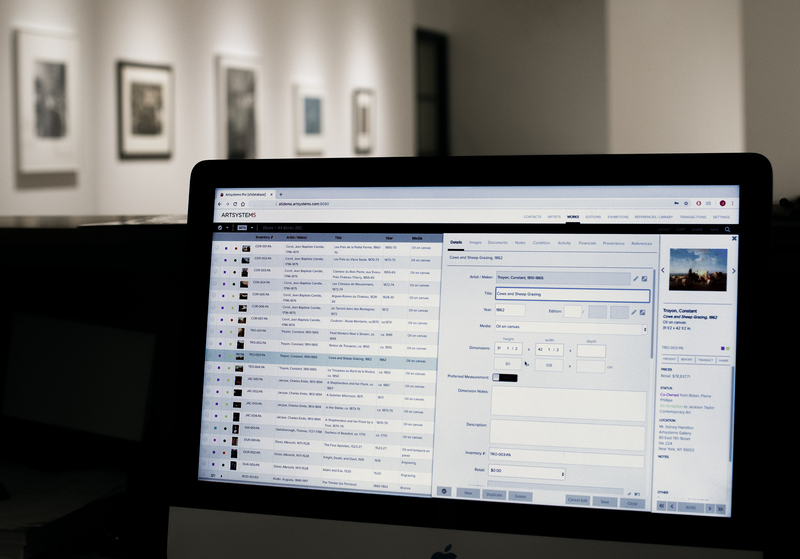 Coupling the benefits of the web with the power, control, and robust features of Pro, A5 is the most integrated and automated art management software available. Utilize any or all of the seven integrated record modules below to save up to 90% of the time previously spent managing art information. Hide modules not needed. Track contact details and correspondence, interests and offers, transactions and accounting. Include contacts’ images, artworks in collection, and much more – directly linked to all other modules. Includes artist details, works, biography, statements, additional images — links to works and artist’s contact record. Record and display artwork details and activity, multiple images, condition, location and financial histories, bibliography, exhibition, and provenance references — directly integrating related records from other modules. Create templates for editions, track availability of works, record details of publishing and expenses. Editioned works also display in Works module, now with the option to hide or display each edition’s works under an Editions master record so that Works module viewing is more efficient. Record and display dates and venues, work details, installation images and notes, press releases, publication references, expenses (soon), and more, linking to works, contacts, and references records. Create Offers, Consignments in and out, Loans, Exhibitions, Invoices, Cash Sales, Purchases, Payments, Payment Receipts, Credits, Shipments, Returns, and Work Receipts — integrating Works and Contacts on the fly. Automatically format bibliography and exhibition citations and associate with multiple works at once. Categorize and index for future use in Infosheets and catalogues raisonnés. Library function tracks owned items. Send artwork offers and other correspondence, saving to contact’s record. Includes full tracking and bounce management. Up to 3,000 emails/month. Affordable packages for more emails available at nominal cost. Create templates for customized email newsletters for exhibitions or other events. Send up to 3,000 emails/month. Affordable packages for additional emails available at nominal cost. Create unlimited number of time-constrained presentation web pages, tracking visitors’ viewing histories within each contact’s record. Each room has thumbnail images with captions, large views, artist bios, formatted PDFs, and more. Portable presentation/sales tool integrated with A5 displays artworks and exhibitions. Search and filter, offer works via email, view private artwork details, artist/exhibition info, news and press — use online and off line. Free to use with A5 subscription for up to five mobile devices. Selectively sync A5 artworks, exhibitions, and supporting material to an Artsystems template or custom Website (additional fees). Submit record details to online service offerings such as shippers, aggregate gallery websites, auctions (to come), and to our blockchain certification integration partner, Verisart. The database automatically links individual records to be a single click away from related records in all seven modules. In this refined and logical system, each record edit automatically updates the related records throughout the database. The result is a profound and comprehensive efficiency in the performance of all information-related tasks. Dozens of pre-configured shortcuts make filtering record lists quick and easy. Combine multiple criteria for advanced queries and save for future one-click access. For example, ‘show me all available works less than $10,000 and less than 50 inches wide’. Select records to create and save editable lists. Generate, display, and print 140 standard reports, lists, labels, and docs online in US or A4 format. Customize and save spreadsheet report templates for reuse. Add boilerplate text via updatable glossary feature. Download to Word or Excel, edit, and attach to records. Supplementary files can be archived with any record. Includes full artwork and contact financial tracking and reporting, including expenses, sales tax, VAT schemes, and ARR. Track partner ownership and cost/profit distribution. Includes special ‘reacquire’ function. Links to general-ledger accounting solutions such as QuickBooks Pro. Create/convert transactions in any foreign currency. Update conversion rates online or define manually. Display any currency on invoices and reports. Base selected works in specific currencies to avoid currency market fluctuations — many features exclusive to Artsystems. 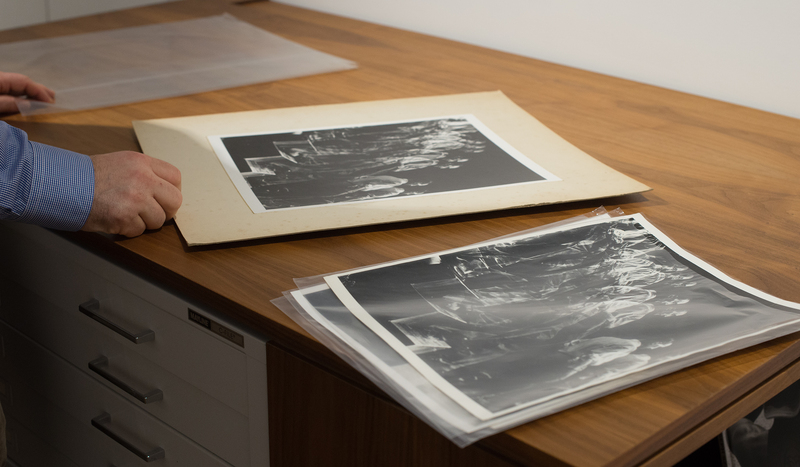 Store multiple images for each record of any type — including works, contacts, editions, exhibitions, artists, and references — automatically resizing and reforming during import for display, reports and documents, email, and export to websites and mobile app content management system. A5 administrators may review all data changes by record, fields, date, and user within the unified history log. Each licensed user has their own private login. Administrators may limit internal access to sensitive data for individuals and groups, by fields and functions: Hide data, limit to read only, or allow full access. A5 includes a 128-bit SSL encrypted online connection with daily backups and 24/7 service monitoring. Artsystems continually improves and updates A5. Each subscription includes all upgrades and updates during the subscription term. All databases are updated automatically. Live telephone/email support from gallery veterans, each with decades of art management experience, within two business hours during our 12-hour day (M – F, 6 to 6 NYC time, 11 to 11 London time). Lower subscription pricing is available for artists, small collections, and smaller institutions. Note: not all features are available with initial release. Don’t care to run or host your database online? We continue to license and support Artsystems Pro, our industry leading desktop software, to run on your desktop computer, remote server, or local network. New or existing report and document templates may be fully customized to suit functional needs or tastes for a nominal fee. Spreadsheet reports may be customized within A5. Contact us for details. Sync selected A5 work and exhibition details and images with an Artsystems website. Selectively sync to ProFile App. Read more about our Gallery, Collection, and Artist websites. Multiple themes and customization are available. Additional device licenses beyond the five free with an A5 subscription are available for an affordable extra fee. Up to 3,000 emails are included with the A5 Pro subscription. Additional email packages are available. Contact us for details. We have 30 years’ experience converting data from all competing systems plus Excel, FileMaker Pro, Access, or other legacy database formats. Contact us for details. Note: due to high demand, data conversions must be scheduled well in advance of expected implementation. A5 can be set to link to general-ledger accounting applications with import capabilities, eliminating any need for a double-entry bookkeeping system. A three-hour support block for setup and support is $299. Two-way integration of Verisart Blockchain Certification is available for permanent and secure certificates of authenticity for artworks in the database. Contact us for details. Large institutions with large databases may employ Artsystem5 on a private region-based AWS server with additional capacity for increased speed, longer-term backups, and additional security. Contact us for details.